The inquests into the death of Diana, Princess of Wales and Dodi Al Fayed will be opened on 6 January 2004, it has been announced. 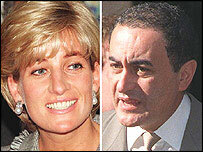 Princess Diana, 36, and Mr Al Fayed, 42, died in a Paris car crash in 1997. Surrey Coroner Michael Burgess said the "complexity of the situation" meant it had taken over a year to set a date. Princess Diana's inquest will be held at the Queen Elizabeth II Conference Centre, London, while Mr Al Fayed's will open in Reigate, Surrey. There will be two separate inquests. Mr Burgess said he had been in touch with the Royal Family and the relatives of Mr Al Fayed to advise them of the date. Dodi's father, Harrods owner Mohamed Al Fayed, welcomed the news, but said he would continue to call for a full public inquiry into the crash. Mr Burgess said there would not be witnesses on the opening day but he would outline the procedure of the inquest and the nature and scope of evidence he expected to be brought. The inquest into the death of the princess will be opened by Mr Burgess, as coroner of The Queen's Household, at 1030 GMT. Mr Al Fayed's will also be opened by him in his capacity as Coroner for Surrey, at 1500 GMT at Wray Park, Reigate, Surrey. "I stated in October 2003 that I intended to hold inquests into the deaths of Diana, Princess of Wales and Dodi Al Fayed," Mr Burgess said. "The opening of these inquests has been the subject of discussion and correspondence with the families for some time but because of the complexity of the situation the final arrangements have taken rather longer to complete than I would have wished." On news of the announcement, a Clarence House spokesman said: "It's entirely a matter for the coroner. "We always understood the law required an inquest at some point." The inquests will be the first official public hearings in Britain to examine the circumstances surrounding the princess's death. They have been delayed by a lengthy police investigation and other factors. Both hearings are likely to be adjourned and no date has yet been given for when the full hearings will take place. Mohamed Al Fayed does not accept the official report in 1999 into the crash which blamed the couple's driver Henri Paul, who had been drinking. He approached the Scottish courts this week to mount a legal argument for a public inquiry into their deaths. His spokesman said that while the development was encouraging, it did not change Mr Al Fayed's desire for a public inquiry. "The remit of a coroner's inquest is far too narrow. It's merely to determine the cause of death," Chester Stern said. "Some people have said to me he's achieved a breakthrough, but this doesn't affect what's happening in the court in Scotland. "This is a matter which requires open public scrutiny on a much broader scale than an inquest can offer." "The inquest into the death of Diana, Princess of Wales, is now finally just weeks away"